Amitav Ghosh. Sea of Poppies. New York: Picador, 2008. I've previously reviewed an earlier work from the prolific and brilliant Amitav Ghosh. 1993's In An Antique Land was an arresting mashup of Ghosh's fieldwork in Egypt and a historical reconstruction of the life of a 12th century Indian slave who moved with his master between Cairo and India. Sea of Poppies finds Ghosh working the same rich themes of culture, language and hierarchy in the Indian Ocean world; but this time the context is colonial India in 1838, with Britain on the brink of the Opium Wars with China. Ghosh conjures up a world of sailors, merchants, convicts, colonial landlords and indentured laborers. The texture of language in the novel is almost unimaginably rich; one needs (and Ghosh provides) a reference index for the many untranslated words from the language of sailors. 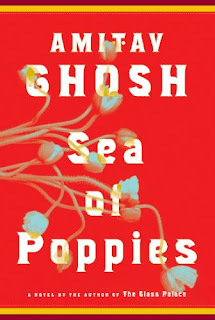 Whereas Ghosh's authorial voice intervened frequently in In An Antique Land, reflecting on both his own identity and the story he is tracking, in Sea of Poppies, the message is in the fully realized world that springs to life in its pages. Ghosh wants to use language to pull us into the dizzying complexity and diversity of the Indian Ocean world; a subject that has fascinated historians and scholars. But Ghosh avoids the romanticism of much of this scholarship by emphasizing the strict social rules and hierarchies that structure individual lives. Racial discrimination, arranged marriages, slavery, caste, Hindu-Muslim relations are just a few of the topics Ghosh broaches with dazzling erudition. Sea of Poppies is to be savored; its plot is easily lost in the texture of the multiple journeys of its fascinating characters--from the freeman Zachary, who is passing for white, to the Brahmin nobleman turned convict Raja Neel Rattan, to Deeti, a low caste opium farmer fleeing the vengeance of her family. But while the plot meanders, the goal is clear enough: each of these richly realized characters will end up aboard the ship Ibis, sailing from Calcutta to Mauritius. With an obvious nod to The Many Headed Hydra, Ghosh emphasizes how a new kind of society emerges from the bowels of the ship; while this journey obliterates many barriers of caste and social distinction, it only serves to heighten other social tensions, propelling the novel forward to its tense and unresolved conclusion (the second novel in the trilogy, River of Smoke, is out now). My only complaint about this magnificent novel is the character of Zachary, an "octoroon" freeman from Baltimore who passes for white. Ghosh struggles to find this character's inner dialogue and his language is curiously unaccented. His position on the ship allows him to talk to and engage with characters across the spectrum of society, both high and low; as such he remains a character who other characters talk to, but who lacks some of their tragedy and inner torment. Thanks for your review of "Sea of Poppies", which I just finished; the book so enthralled me that I've now reserved a library copy of the second book in Ghosh's Ibis trilogy, "River of Smoke". Thanks, too, for reviewing "Cargoes of the East". I purchased an old copy, and was especially intrigued with the chapter about Lamu. wa salaam Thank you Mr (Ms?) LM Jackson. I am glad you enjoyed the book an the review. I hope to read "River of Smoke" in the near future, inshallah. To be clear, I did not review Cargoes of the East. That is an older review from Third World Quarterly. Thanks for stopping through the site.